During a workshop that I held this summer, a mom interrupted me when I was talking about a College Board search engine that parents can use when they are looking for the schools that provide the best need-based financial aid. The typical level of student loan debt for graduates. The average percentage of financial need that a school meets in its aid packages. To reach the site’s College Match section, just click on the Search for Colleges link on the home page. You will be directed to the search tool. You can type in the name of a school and find information on that institution or use the college search function. 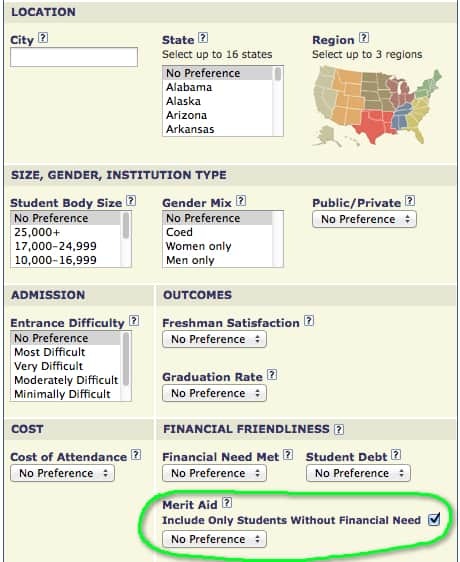 If you want to search by schools that give merit aid, use the merit aid criteria that I’ve circled below. You should keep in mind that nearly all schools — except the most elite — award merit scholarships to wealthy students. Consequently, you are going to want to use other criteria offered by this search tool to narrow the universe. I hope some of you find this tool helpful. 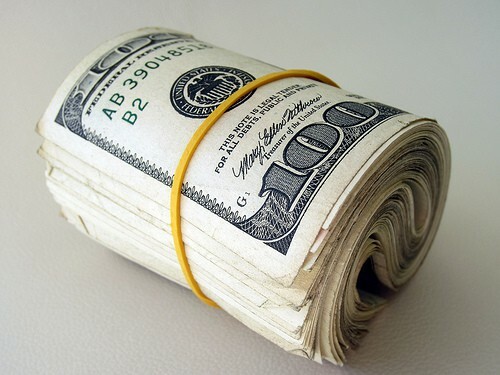 Image courtesy of Flickr user Images_of_Money. This is a great – and something I’ve been looking for. The site itself seems linked to financial services though, so I worry about providing too much data to them but what they provide seems really helpful. No wonder they ask in the sign up if you plan to give your child a credit card! Still, you don’t need to log in to get to this data. If you check that box, the merit aid figure that comes up is the percentage of students that got NON-NEED based merit awards offered? I know some schools have merit awards/scholarships that are based on need…. No need to worry about anybody getting your data when you use this tool. And yes, when you check the box you are looking for schools that give merit aid to wealthy students. Thanks for the illustration of this site, which looks like a nice additional to my arsenal. I have a follow up question if you don’t mind. I looked up the U of Kansas, which is of interest to me for my clients in Denver with interest in large rah-rah schools and got the following: Non-res COA = $34,832; 60% of need met; 36% of students awarded merit aid. How would you personally rate this: good, medium, or lackluster? I just learned that one of my clients with a very good (but not staggeringly good) profile seems to have what it takes to win a $6000 yearly KU Excellence award. The student in question has a 3.565 unweighted and 4.174 weighted GPA, a history of taking IB and AP classes, and an ACT cumulative score of 26. She is retesting and doing prep with me, and it appears that if her cumulative ACT comes up to a 28 the award would be for over $9000. It is renewable for 4 years if the student maintains good grades. I would love to know your thoughts on how this stacks up with other large publics on a non-res basis. I am also sending you a personal email about some other stuff.